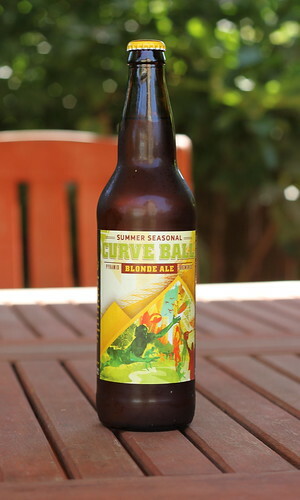 Pyramid week continues here at Pints and Steins, as earlier in the week we checked out Curve Ball Blonde Ale. Today’s brew to evaluate is the Seattle, Washington brewery’s hefeweizen. Haywire Hefeweizen is the company’s wheat beer offering. As some might now, hefeweizen is an unfiltered wheat beer that is very popular hear in the Northwest. In fact, the most popular micro-brew from the Northwest is likely Widmer Hefeweizen, as I see that particular beer on tap no matter where I go in the country. The standard by which all other wheat beers are judged. Our deliciously deranged American-Style Hefeweizen is an award winning take on this Bavarian classic. This refreshingly unfiltered wheat ale delivers a distinctively smooth flavor worth sharing with friends. In my opinion, Haywire Hefeweizen is an amazing wheat beer that is not to be missed. This cloudy beer has enough flavor to light up any summer afternoon. The initial sip brings you a soft refreshing flavor. The aftertaste is a bit sweet and fruity, enough to be noticed but it’s not overwhelming. Pyramid’s Haywire is a perfect summer beer and would go great with any type of meal featuring a white meat or even seafood. So over at Farmer Brewing, the guy behind the blog is an apprentice brewer who is from the mid-valley who is doing his apprenticeship up in the Tri-Cities area of Washington. In his post titled “Is it Time, Salem“, he talks about how Salem is in need of a microbrwerey and asks whether we’d like a brewery here. My answer (I left a comment) was a resounding YES, PLEASE! As you can see by this site, I love good beer. I really enjoy going to Bend, Oregon because there are 6+ microbreweries in and around town. Corvallis has two breweries including Block 15 and Flat Tail Brewing. Why can’t Oregon’s second largest city have it’s own locally owned brewery?! We can, and we shall! So, if you’re so inclined, head over to his post and encourage this young brewer to come back to Salem and open a microbrewery here in Oregon’s capital. Let’s do this! You are currently browsing the Pints And Steins weblog archives for August, 2010.